1. DCA Malaysia Airworthiness Notice (AN) No. 77 issue 1 dated 15 May 2005 has mandated the requirements to meet Reduced Vertical Separation Minimum (RVSM) and Required Navigation Performance (RNP) for aircraft to fly at and above FL 290 (29,000 feet). 2. RVSM means vertical separation between aircraft of 1000 ft between FL 290 and FL 410 both inclusive. For RNP-10, an aircraft is required to maintain a lateral position within 10nm of its air traffic (ATC) cleared position 95% of the total flying time. 3. RVSM airspace has been imposed for South China Sea since Nov 2002 and most routes in this region are already RNP-10. RVSM and RNP-10 are expected to be implemented over the Indian Ocean in the near future. 4. At present most of B727 fleet are flying below FL 290 and on non-RNP10 routes because existing avionics equipment are not compliant to RVSM and RNP-10 requirements.  Reduced flexibility in timing of flights.  Increased air safety since ATC workload is expected to reduce with RVSM implemented.  Better marketability for leasing out. a) To upgrade the ADC B13 to B100. The RVSM compliant p/n is HG480B100. With reference to Boeing 727-SL-02-004, page 1 of 9, issue dated 8th Oct 1996 stated that HG480B100 is equivalent to HG480B13 DADC with Static Source Error Correction (SSEC) incorporated. 3. 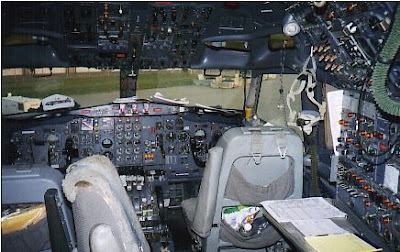 Replace F/O’s pneumatic altimeter with a new electric altimeter; Replace standby pneumatic altimeter with a new non-metric standby pneumatic altimeter; Check airframe skin waviness per Boeing SB 727-53-0220; and Carry out revenue flights with portable loaned equipment to verify the altimetry. ICAO has introduced RVSM in 2002 to increase optimization of aircraft operations and support the increasing traffic volume worldwide. This concept consists of the reduction of aircraft vertical separation minimum from 2000 feet to 1000 feet between flight levels 290 and 410 (inclusive); thus, doubling the airspace capacity. In addition, an aircraft flying in the RVSM airspace can operate smoothly at its optimum flight level, enabling fuel efficiency and reducing flight delays and operational costs for aircraft operators. 2. Why Monitoring Is Required? Reducing vertical separation minimum by half can pose a safety problem for aircraft not able to keep its flying altitude. Thus, inspections and approvals are required before aircraft can operate in RVSM airspace. In addition, height keeping performance is also required to ensure the level of safety set by ICAO. 1. Dual flight management navigation systems (FMS) are required to be fitted and coupled to autopilot, HSI and flight director system (FAA Order: 8400-12A). Most airlines like Air Asia, MAS, SIA, Qantas etc fit such dual FMS systems. 2. For aircraft (B727) fitted with existing primary navigation Litton LTN-450 NMS, the unit is no longer in production. DCAM has not accepted this system together with stand-alone GPS as RNP 10 compliant. So it would make sense to standardize the B727-200 fleet dual FMS installation. 4. Alternate modification to comply with RNP-10 is using upgraded GPS Trimble model 2101 I/O (instead of dual FMCs); and this proposal is agreed by DCAM. i. replace the existing GPS receivers Freeflight 2101 with Freeflight 2101 I/O Approach Plus. iii. hook up the GPS system with the captain’s HSI, flight director and autopilot. 81440-02-241L are installed at the existing location to meet RNP-10 compliance. 7. The existing dual GPS receiver Freeflight 2101 P/N 81439-00-242B have been replaced with new GPS Receiver Freeflight 2101 I/O Approach Plus P/N 81440-02-241M (or latest s/w version) and both are fully interchangeable. 8. Pls note that ONLY GPS Receiver Freeflight 2101 I/O Approach Plus P/N 81440-02-241L (M ore latest s/ware) meets RNP-10 requirements. 9. Only GPS No. 1 coupled to Autopilot Roll Steering. 10. ADC No. 1 provides air data input to both GPS No. 1 and No. 2. 11. Both GPS 2101 I/O Approach Plus receivers are coupled to both HSIs (Capt and FO).